When you hear talk of a pig going on tour, your first thought might be of Miss Piggy. Not in this case. 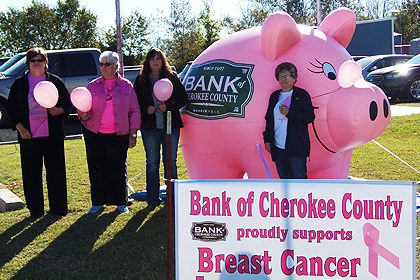 Bank of Cherokee has a different pig and a much higher purpose in mind. Following a tradition of community service, Beth West, Director of Marketing and Community Development, chose Landmark Creations to design and bring to life "Penny," their inflatable mascot. Standing 13 feet high and proudly sporting the bank logo, Penny springs onto the scene ready to handle an impressive tour schedule. "Penny will be featured at the Annual Wild West Fall Fest, a local festival raising awareness for all special-needs persons, young and old," says Ms. West. "Penny Pig will also be on our Christmas Parade Float in our two area Christmas parades. Her inaugural event was honoring breast cancer survivors for October Breast Cancer Awareness month. We invited survivors to participate in a balloon release, as seen in the picture." Because of her compact size and easy portability, Penny should have no problem keeping pace with all her public appearances. Check out her first video on social media!